The following report dated 8 March 2001 is copied from the web site of the University of Edinburgh, UK http://www.ed.ac.uk/ and printed with permission. This was the fourth year of the Science, Engineering and Technology mentoring programme and it ran with 31 mentoring pairs. The programme is funded from the central staff development budget and by the Faculties involved. The evaluation was conducted as in previous years by means of a questionnaire issued to all mentors and mentees at the end of the programme and a final evaluation /networking event. The Springboard programme was evaluated separately. what changes could be made to improve the programme still further. encourage the development of coaching and counselling skills within the mentors. contribute to an increase in the proportions of women at Senior Lecturer and Professorial level within the University. The 1999/2000 project established thirty one mentoring pairs linking women at or near the beginning of their careers with more senior women, who acted as mentors. In addition to the mentoring process, the group of Mentees completed the Springboard Women's Development Programme, which provides a structured approach to reviewing key career development options. The programme was publicised throughout the Faculty Groups by a range of methods including personal letters; two information sessions were held for potential mentors and mentees to ensure that potential participants had a clear idea of the purpose and content of the programme. Criteria were established to ensure that mentors and mentees were matched appropriately, taking account of the experience of other mentoring programmes, to ensure that both parties achieved the most benefit from the mentoring process, the matching process was primarily driven by the mentee's requirements. It was expected that the mentor and mentee would meet at least twice per term to exchange information, ideas and opinions although this was at the discretion of the pairs, most pairs met 3 to 8 times, with meetings being of varying lengths. Meetings were structured to some extent, however the precise arrangements were negotiated and agreed by each mentoring pair. The mentoring relationships were monitored over the course of the programme and attempts made to resolve any problems as they arose. There were very few problems this year. However, one mentee was assigned a replacement mentor as there were some difficulties with the relationship. The Springboard Women's Development Programme is a well-established programme, which provides a structured method of establishing career goals and options. It is used with other University staff with positive results and it has a successful track record in a range of public and private sector organisations. It was expected that the Springboard activities and discussions would overlap with themes in the mentoring exchanges and half of the mentees had indeed used Springboard to provide a framework for the mentoring discussions. Project evaluation was carried out by means of questionnaires to mentees and mentors and a final networking and evaluation session at which the programme and its impact was discussed. The Springboard course was also evaluated. the potential for expanding the scheme to other areas. The suitability of the matches this year was very satisfactory with only 1 mentee saying the match was not suitable because the mentor was in a different scientific area. All the mentors thought the matches were either suitable or very suitable. Mentees identified a range of benefits from the programme with 85% saying they had benefited from their mentor's experience and the same percentage saying their confidence had increased. 65% said they had a clearer career plan and smaller numbers said that they had benefited from networking and that the programme had given them the strength to keep going. 78% of mentors said they had benefited from contributing to someone's future but in addition, 20% of mentors said their confidence had increased since being involved in the programme and some also said they had benefited from networking. One of the criticisms of the programme was that there had been less opportunity for mentors to network this year and this will be addressed in future programmes. Mentors also identified that the mentees' attitudes had helped to keep them motivated and that the process presented an opportunity for mentors to reflect on their own career and activities. 40% of mentees reported that their career aspirations had changed since the beginning of the programme and 65% had made positive moves in their career. Half of the mentors involved had also made positive moves in the career over the course of the year but several pointed out that this was not as a direct result of the programme. Almost all the mentees reported that they were either very optimistic or quite optimistic about their career prospects and 75% said that their optimism had increased over the period of the programme. Mentors were less optimistic on the whole possibly reflecting uncertainty over contracts and funding as well as particular issues for women in Science. However, 78% said they were either very optimistic or quite optimistic. 13% of mentors said they had become more optimistic over the course of the programme with 9% saying they had become more pessimistic but stressed that this was not due to the programme but other factors. As in previous years, mentees where asked whether they felt the mentoring experience or the Springboard programme was most important and most (70%) said that both parts were equally important with many mentees using parts of the Springboard programme to structure their discussions with their mentor. Of the remainder, 20% thought the mentoring was more important and 10% thought the Springboard programme more important. As in previous years, 80% of mentees and 80% of mentors thought it was either quite important or very important that it was a programme for women only. A minority of 20% thought it was not important and some people thought the young men would also benefit from such a programme. "I have a good trusting relationship with my mentor. She is professional/astute/experienced and a really nice person. I would like to continue to benefit from her experience both as a professional and as a woman"
"It's good just knowing that there is someone different to talk to when things get on top of you"
"It was a very beneficial and positive experience. She was easy to approach and speak to about most issues"
"It has been good to have someone to talk to, unconnected with my department - but who understands the trials of Academic life"
"Mostly my mentee's energy and positivism was so impressive that I got motivated at least as much as I was able to motivate her"
"Always a pleasure to meet up with people from different disciplines because you can become very isolated within your own department"
The evaluation of progress from the mentors and mentees continue to be very positive, and the staff involved are keen that the programme should continue within the University. In the forth-coming year there will be a cut in funding from the faculties and centrally and other options for funding will have to be explored if the programme is to continue at a similar level. 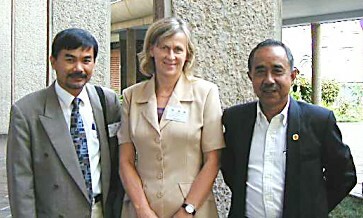 Kari Strande is international adviser by Statens kartverk (Norwegian Mapping Authority) in Norway. She is educated in surveying and land use planning / land consolidation at the University of Agriculture at Ås. She started her career in the Ministry of Environment working with outdoor recreation issues, especially in making areas along the coastline available to the public. Here the subjects of property law, valuation and use of maps were helpful skills. After one year in the Ministry she complemented her studies in planning issues at the University of Architecture in Oslo and in law on special subject expropriation and valuation at the University of Oslo. In 1976 she was asked to carry out a project to collect materials and edit a book on mapping and use of maps. The project had the objectives of creating a book in Cartography that could be easily read both by students in surveying and mapping issues, politicians and planners. Both German and English literature where searched and all the Geographic and survey institutions and organisations in Norway contributed to the project that finalised in a book published in 1981 and up-dated in 1986. It was used in technical schools, colleges and universities up to 2000. Now it is outdated, but there is still a need for such materials, may be now more addressed to teachers in primary and secondary schools. In the period 1976 to 1986 she was working as planner and manager at municipal and regional level and was really a user herself of Geographic Information. In this period she was also engaged in boards of various organisations such as Norwegian Association of Cartography, Geodesy and Hydrography, Norwegian Association of Chartered Surveyors, Norwegian Mapping Council and Norwegian Orienteering Federation. She was also member of a Nordic Group in District Development and member of a Governmental working group preparing the New Act of Planning which came into force in 1986. In the period 1980 - 1981 she participated in the 10 weeks courses in Society Planning organised by the Ministry of Environment and broadened her network. In 1992 -1993 she attended a programme in management organised by a specialised institute in Northern Norway. The courses here were based on a more including and participatory management philosophy than the more economic management trends. In the period 1986 -1994 she was engaged as director of the Land Mapping Division in Statens kartverk (Norwegian Mapping Authority). This was a period with big changes and challenges in the field of Geographic Information and this also demanded changes and new organisational structure of the leading institution in this field in Norway. In this period Statens kartverk and Kari was engaged in promoting women to take part in the surveying and mapping field. She also was a mentor for two girls in her institution in a governmental program for training future female managers. In this period she was engaged in several boards by various institutions like Gjøvik College in engineering, nursing and forestry, Norwegian Space Agency, The Geological Survey of Norway and Norwegian Soil and Forestry Survey. In 1995 Kari left her management occupation and went into a new role as international and strategic adviser to the Director General. This opened for new contacts all over the world and engagement both in Nordic, European and Global organisations like EUROGI, EuroGeographics and FIG. Kari is Norwegian delegate to Commission 3 in FIG and her primary concern is dissemination of understanding of the Value for Society by use of Geographic Information and GIS. She has presented papers at various FIG conferences on the issues of Norwegian policy on spatial data infrastructure, GI-Value for Society and Area management systems. In private Kari is engaged in sport and outdoor activities, mainly Orienteering where she both compete and participate in the management at several levels. She is fond of music and used to sing in quires and participate in various entertainment activities before she moved to Hønefoss. In respectively 1992 and 1994 she and her husband adopted two children from Vietnam and Kari has also established contacts with colleges in Vietnam. Now she is preparing an exchange programme between Norway, Vietnam and Laos in the surveying and land administration field. The programme is established for people at the age between 22 and 35. Why to deal with Under-represented Groups in FIG? The work of FIG depends on a relatively small number of surveyors considering the fact that FIG represents about 230,000 persons in the surveying profession. These international active survey-ors are an ageing and overbalancing male population. The number of young men and women engaged in the work of FIG is of concern. And there is also a lack of participants from associations (countries) which are financially less strong. facilitating professional contacts for women and young surveyors, as well as for linguistic minorities, within the FIG community. The time span of this Task Force is limited and will end in 2002 with the FIG Congress in Washington. The Task Force mainly focussed its work on the major under-represented groups in FIG: women and young professionals. We do not know how many women work in all fields of the Surveying profession or have an education in Surveying and we do not know how many young professionals will come into the profession. To get more information the Task Force sent out two questionnaires to FIG member associations and to universities in 1998. From 73 member associations answered 15 (21 %) and from 204 universities 45 (22 %). All results can be found on the FIG homepage (http://www.fig.net/figtree/tf/underrep/tfunrep.htm ). Together with the answers to the questionnaire member associations and universities reported about several activities concerning under-represented groups. This was the starting point to establish a Newsletter. The quarterly Newsletter gave background information concerning national associations, international organisations, universities, "Women's Access to Land", congresses, scientific research and political decisions. Every issue presents one female personality of the surveying profession. The last issue will come out in March 2002. All newsletters are as well available on the FIG homepage. Many thanks to Markku Villikka for his excellent job publishing all editions of the newsletters and supporting the Task Forces' activities. 4. "Women's Access to Land"
The Task Force has been building up a network with 56 members (71 % women) at the moment. Many contacts to colleagues and the exchange of experiences motivate to get in contact with FIG. Using Internet and mailing opportunities the contact to other gender working groups in national and international associations (e.g. Commission on Gender and Cartography of the International Cartographic Association ICA; ICEFloe Equal Opportunities Forum of the Institution of Civil Engineers, UK; Forum for Equal Opportunity of the American Congress on Surveying and Mapping) has been established. The co-operation with the FIG Commissions 1 and 2 were excellent. John Parker and Kirsi Virrantaus, the Chairs of both Commissions, participated at all Task Force meetings and brought the Task Force activities forward. Four articles of the Task Force Group of FIG Commission 7 „Women's Access to Land" were published in the Task Force Newsletter giving the opportunity of a broader discussion and facilitating the implementation of the proposals. The contacts between the Task force on under-represented groups in surveying and UNCHS Habitat were intensified at the FIG Working Week in Prague. Dr. Sylvie Lacroux from Habitat gave two very interesting and informative presentations during the week. Her first presentation "The Security of Tenure in post-conflict Situations" was given at the technical session "Co-operation with International Bodies and Organisations". The second paper "Under-represented Groups in Urban Development Issues Including in the Professional Practice" prepared by Dr. Sylvie Lacroux, Diana Lee-Smith and Catalina Trujillo was presented at the first meeting of the Task force. The discussion that followed her presentation gave a deep insight into the activities of Habitat. to provide meeting points with tea and coffee or lunch. to announce them as open meetings for all Congress participants. to increase the amount of student members. to support corresponding members, to inform them (topical homepages) and to facilitate the attendance of commission meetings. that there should be at least one woman in all FIG Nominations Review Committees. On behalf of the FIG Task Force on Under-represented Groups in Surveying an e-mail was distributed by Markku Villikka, Director of the FIG Office, to Member Associations, Affiliates, Academic Members, Corporate Members, Correspondents, Council Members, Officers of Commissions and Permanent Institutions, Honorary Presidents and Honorary Members to ask for assistance to support and encourage the Under-represented Groups in Surveying to attend the FIG Congress 2002 in Washington, DC and to give presentations. Many thanks to the Congress organisers, especially the Congress Director Mary Clawson for fixing a special low registration fee for students and also a lower registration fee for speakers. And the Washington Congress will be the first FIG event to get information about the participants concerning commissions, gender, age and first attendance. The Task Force on Under-represented Groups gave a lot of recommendations and made a lot of proposals. FIG forum for under-represented groups will be established to continue with networking. the survey of the Washington Congress registration and the registration of the following FIG Working Weeks.